Trikes and (odd) bikes. : 21st August: Puncturing psycho's egos. Saturday 21st 52F, 11C, almost calm, heavy overcast. Walkies! A grey and miserable start with misty drizzle as I tried to capture the rather drab mood of the landscape. I watched in amusement as a jackdaw paddled bow-legged in a field pond beside an immature gull. They both eyed each other as the jackdaw pushed the gull's social boundaries. Then, just as I thought it was a quiet start to the shooting season, rapid gunfire erupted from the woods ahead. I decided to do an about-turn rather than entangle myself in a potential conflict of interests. The farmers and landowners tolerate my muddying my boots all over their property. So a bit of give and take is obviously desirable. I had punctured by the time I reached the village. Probably small flints carried freely onto the roads with their generous quantities of mud by the farmers. There has also been a lot of broken bottles on the cycle paths recently. So a local psycho may be expressing their artistic talent for glass arranging. On the way back an evil, registered blind, senile, drug addled, drunken, psychopathic bully brushed my elbow with his wing mirror. Then accelerated away on a straight road. Shame action cameras are illegal in Denmark or I'd have his registration plate and the police could have a word with the raving lunatic. Perhaps they'd also do something about pushing cyclists straight off a raised pavement cycle path into the traffic just as the road is narrowed by bollards outside the school. Further spoilt by broad asphalt ramps for several private drives. They'll easily recognise the spot by the huge, scattered potholes which have been there for longer than living memory. Several cave divers have gone missing down there but nobody cared. They couldn't hear their desperate calls above the roar of 7-axle, rat-running articulated lorries and speeding Audi and Mercedes drivers being self-important. What price a single traffic camera pointing in each direction to curb the folly? Ironically, the immigrant drug gangs in the cities have been painting over the lenses of literally hundreds of security cameras to hide their illegal activities. You can well imagine what that has cost the ratepayers/taxpayers! I didn't even know these cameras existed. Only 7 miles, limped home on the flat tyre. It's daft to get filthy from gritty tires mending a puncture so close to home. I have had new tyres and tubes resting in a box in the shed for about a year now. They were just waiting for en excuse for an airing. The old tyres are worn flat across the treads like a steam roller. So their days were numbered even with my present low mileages. I can't remember puncturing this year but have probably forgotten. There were a few tiny pale blue dots where the tread was showing the protective under-strip through very small holes. There were no cuts though. So they can't be what passes for Continental "rubber." I'm still using the Schwalbe Durano Plus in 700x25C. 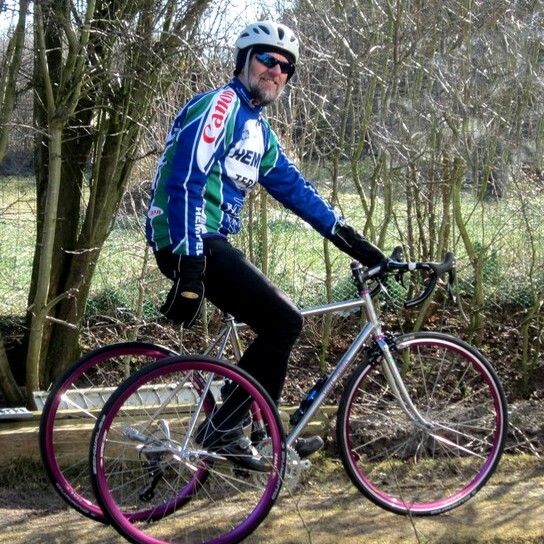 A recommendation from a bike shop, wheel builder in the UK a few years back and very reliable. These tyres still have a liveliness about them despite their excellent puncture protection. Though smooth on the treads they are too heavy for a racing tyre. I run mine at about 90psi after some experimentation. Quite an attractive tyre it doesn't look odd, at all, on a racing bike or trike for commuting or touring. Still unsure about the Vetta saddle. I was shifting about more than usual. Still trying to find the sweet spot. A good saddle should be easily forgotten. Not draw attention to itself. Brand new and already muddy! Sunday 22nd 59F, 10C, heavy overcast, light winds. Possible sunshine this morning. Rain this afternoon. There were a few brief flashes of sunshine but not many. Walked to the village and back. No ride today.